Discover the secretive history of the Knights Templar in Portugal on a small-group tour from Lisbon to the towns of Constancia and Tomar. You’ll learn the Templars' story, as you explore Almourol Castle, the Convent of Christ, and other fascinating Knights Templar sites that offer a unique perspective on the order of Christian knights. 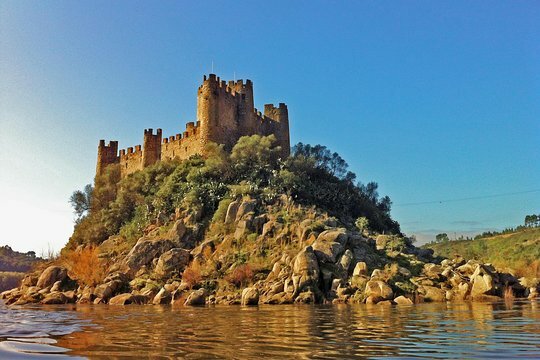 After meeting up in central Lisbon, travel to the mysterious Almourol Castle, built by the Knights Templar to defend their territorial boundaries. You’ll see the castle on the water, as you approach by boat and then have time to explore the fortifications. Next, continue to the village of Constancia, stopping by the magnificent Parque Constancia for a leisurely stroll and a taste of a local delicacy made from almonds and eggs. In Tomar, you’ll see an entire city built by the Knights Templar, with four religious monuments that form a massive cross. Tour the Castle of Tomar and the Convent of Christ, a 12th-century UNESCO World Heritage Site, and enjoy a full afternoon in Tomar, where you can purchase lunch at a local restaurant and visit more Templar sites. Following a day of Templar mysteries and lore, this tour concludes with drop-off at the original departure point. Excellent option for a rainy day. Our guide was very well informed regarding the topic and I found it very interesting. Great meeting people from other countries too. This was a fabulous tour!!! My friend and I took this tour and it was awesome, we had a blast. Our tour guide Ricardo was very good and his knowledge of the area and history was beyond amazing. The sights were beautiful and structures we visited were truly breathtaking!!! Get quick answers from Small-Group Tour: Knights Templar Historical Tour from Lisbon staff and past visitors. is there pick up from the marriott Lisbon? I have signed up for a tour online but was unable to select a pick up point, how do I go back in and edit my tour? How long does this tour last? 4, 6, 8 hours???? We will be staying at the TURIM Av. Liberdade Hotel. Is there a pickup-drop off point near there?